In a world obsessed with Tinder, treating yourself and TGI Fridays, sometimes we forget about our nearest and dearest pals. And if all your recent hangs have consisted of binge eating ice cream while binge watching Mindhunter (obsessed… no judgement), then consider ditching the tracky-dacks for the day and take your best bud out on a date! As The Beatles famously crooned, ‘I get high with a little help from my friends.’ And we at the G&G think we know exactly what they meant: high tea of course! And as for where to treat your friends to crisp teacakes and sugary macarons, look no further than The Lab. 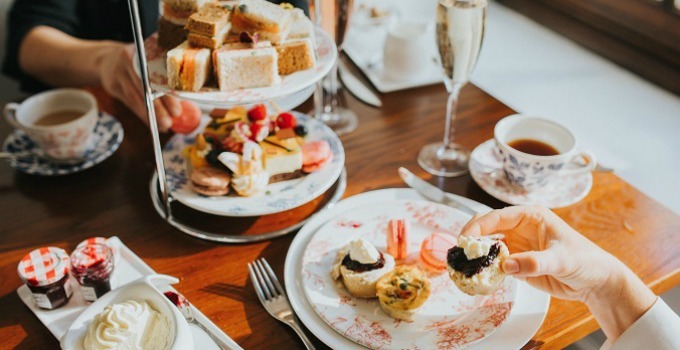 Set in the heritage listed Treasury Hotel, indulge in a selection of sweet and savoury delights with decadent hand-crafted teas and champagne. Read why we love it. If your bestie has a fine palate, and even finer palette, pair them with an easel at one of Cork and Chroma’s painting sessions. All about letting your creative freak fly, Cork and Chroma lets you pop a bottle of champagne (BYO, so you know it’s gonna be good!) while an in-house artist guides you through creating a masterpiece. For those with grumbly tummies, nibbles are also provided at an extra cost by Milk Factory next door. Everyone knows that the best D&Ms happen over a cup of good ol’ gelato. Well, what better way to take you and bestie’s friendship to the next level than by having your next salacious convo occur during a gelato-making workshop? The gelato-making classes at La Marcelleria Gelataria are our top pick! If you love to polish off mojitos as much as polishing your nails, then you and your friend have come to the right place! Arbour Nail Lounge & Bar combines two great loves, with the luxurious mani and pedi stations partnered with a fully decked bar complete with wine, cocktails, and even tea (for those who need to spill it). And let’s not forget Arbour’s expert nail techs, who ensure that you are literally in good hands! If you and your bestie are saying yes to a day out, but your wallets are saying no, why not skip the beer gardens and go straight to the real thing? It’s time to put those MasterChef skills to the test (surely, we learnt something from watching all nine seasons?) by DIY-ing lunch and heading out for a picnic in the park. Get the down-low on all our favourite picnic spots (and where to get the best food) here. Masterchef skills lacking despite those aforementioned nine seasons? We got you. Or rather, Brisbane’s best cooking schools have. Learn how to bbq, delve into traditional French cooking or tackle the craft of kombucha. Best yet? You can enjoy the profits of labour at the end! Here’s our pick of where to take a class. Diamonds are a girl’s best friend, so treat yours to some sparkles at Bellini Sundays! Alas, while we can’t afford actual diamonds (if only), the sparkling Prosecco wine and peach puree cocktails at Darling and Co are the next best thing! For two hours you can enjoy Bellini Sunday’s bottomless cocktails, funky DJ beats, and a scrumptious main meal – and for only $39.00pp. If your friend is Carl Barron-obsessed and has more than a few funny bones in their body, then prepare to knock their socks off at Knockoff at the Powerhouse! Run by the impressive ImproMafia, their hilarious skits and rowdy one-liners are the perfect way to kick off TGI-Fridays! We recommend pairing the outing with some spritz and spaghetti at Bar Alto afterwards. So if your friend loves tea-times, tee-offs, tee-hees, or tequila, then take them to any one of these places for a quality time.